Technical diving has always been a very rewarding aspect of my career but recently I experienced something truly unique and a first for me underwater. The beginning of March 2013 brought our annual Olympus Dive Center Tech trek to Key Largo, Florida. We dove with Blue Iguana Dive charters, and Capt Scotty and the crew showed us a great time as always. With Trimix students in tow we planned to visit many of the popular wreck sites of the upper Keys both deep and shallow. Although Keys diving differs from diving the Graveyard of the Atlantic, it offers training similarities to Technical diving in North Carolina and accessible warmer water in the winter months. The first of our planned Trimix dives was on the wreck of the Queen of Nassau off the coast from Islamorada. I decided to test the depth limitation of 197fsw listed on the box my Gopro camera came in. Turning it on at about 150' I was not expecting it to work well but figured it could not hurt to give it a try. Our hot drop on the Queen went smoothly and we began to explore the wreck. After seeing her unique "ram-like" bow intrepid Trimix student Andrew and I headed towards the stern. Sidebar- it is an awesome feeling to be surrounded by former and present Trimix students- peers all of them, while enjoying the delights that a deep shipwreck has to offer. Things continued to great interesting after the dive as I learned from our crew how rare Sawfish sightings are and that they are on the critically endangered list. Before I had even returned to Morehead City I had a Facebook request from the Florida Museum of Natural history-Ichthyology Department who runs the International Sawfish Database asking me to contribute my observation to their database. 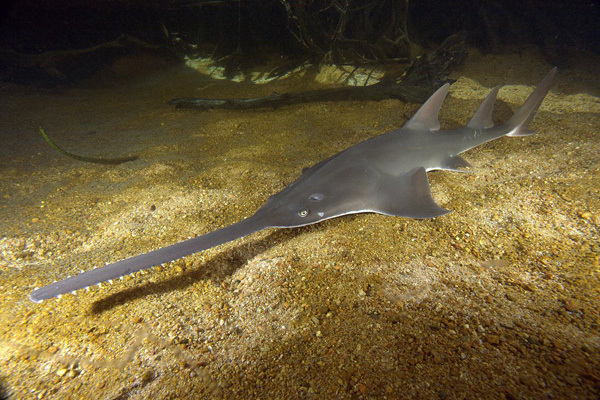 Then, Padi's Project Aware Facebook re-posted the video shortly after a successful CITES conference where, incidentally, the Sawfish was included as one of the critically endangered species within their proposal. The point is that you never know where a simple video taken on a comfortable well planned Trimix dive to 220fsw can take you. For more information about our recreational and Technical courses please visit the training section of our website.